Avengers: Infinity War and theory-crafting go together like peanut butter and jelly: it's hard to have one without having the other. Speculation swirled around the monstrous Marvel movie long before it even touched down in theaters, causing fans' heads to spin a mile a minute with ideas about who would live, who would die, and what exactly Josh Brolin's purple-faced Thanos would end up doing. As it turns out, the theories didn't stop after Infinity War premiered on April 27. 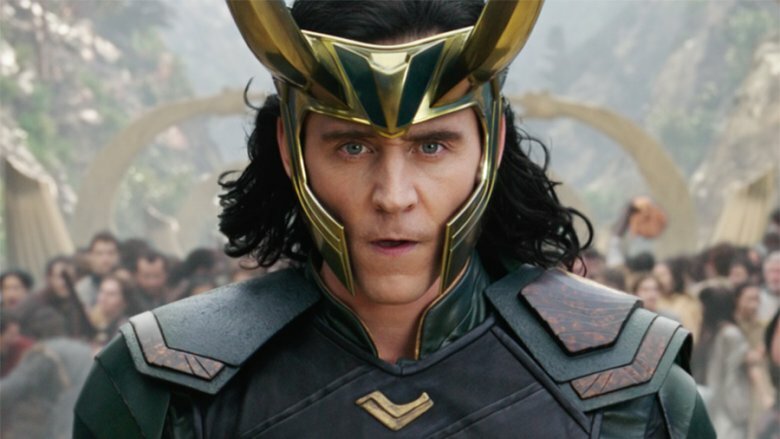 A new idea from journalist Josh L. Dickey, mapped out in detail by ScreenRant's Thomas Bacon, suggests that Loki (Tom Hiddleston) didn't actually die in the first few minutes of the film. Instead, he's alive and well — and masquerading as Bruce Banner (Mark Ruffalo). Dickey's daring theory first notes that "Loki's dagger sneak attack on Thanos was feeble" and "he knew it wouldn't work," and so he ventured to fool everyone yet again by heading off to Earth and posing as Banner. The proposition grounds itself in the fact that there was something off about the Infinity War scenes that involved Banner. He was "acting loopy" and slightly out of character, evidenced by his passion-less interactions with Black Widow (Scarlett Johnasson) and his inability to "Hulk out." Banner avoiding personal talk with Black Widow could simply be down to the fact that two years have passed since the pair saw one another, and they may have simply moved on from their romance, but that explanation doesn't exactly work when considering Banner's perspective in more detail. Because he's spent the last two years living exclusively as the Hulk, battling as the Grandmaster's (Jeff Goldblum) plaything in the Contest of Champions on Sakaar, he didn't, until the events of Thor: Ragnarok, realize how much time had passed. To Banner, what happened in Avengers: Age of Ultron went down mere days ago, so he should have been at least a bit more emotional when seeing Black Widow again, right? On Earth, Banner also seems to understand that "deception [is] more useful now than force," and who is more skilled in the art of deception than the God of Mischief himself? The theory posits that Banner's inner struggle with Hulk may actually be down to Loki disguising himself as the super-smart scientist but being unwilling to impersonate the not-so-jolly giant, thus explaining why viewers saw only Banner after the opening sequence in which Thanos brutally beats the Hulk, and why the big green guy didn't reappear in his full-on form later in Infinity War. This point of the idea could also explain why Banner is suddenly able to recall events that happened over the two years during which he was permanently living as his angry alter ego; it's Loki's recollection, not Banner's. Additionally, this theory presented by Dickey, which he mentioned he "did not conceive" but simply brought into the public eye, may provide extra insight into how Banner landed directly in Doctor Strange's (Benedict Cumberbatch) Sanctum Sanctorum when he returned to Earth. Loki has encountered the Master of the Mystic Arts before, so it's plausible that he may have directed his path from outer space back to Earth towards Doctor Strange, as he knew he would be a quality choice to spearhead the fight against Thanos. If all this is true, it means the real Hulk may have escaped the Asgardian ship with Valkyrie (Tessa Thompson) and the rest of the planet's refugees before Thanos scooped up the Infinity Stones and wiped out half the universe's population. The hard-drinking Valkyrie is expected to make an appearance in Avengers 4, although she hasn't been confirmed, so maybe, just maybe, she'll pop up with the Hulk in tow and catalyze a jaw-dropping plot twist that sees Loki finally admit to his trickery. Until Avengers 4 launches in theaters on May 3, 2019, Marvels fans will just have to play the guessing game.